Review: Makeup Revolution Highlighter Palette Radiance...!!! The MUR Radiance Palette comes in a sleek glossy black packaging. Like all previous MUR palettes, there is a big mirror inside this one too. The soft texture of the highlighters in this palette causes some fall out in the pan. But that's not a big issue for me. Overall, the packaging is nice and sleek and not at all bad for the price. 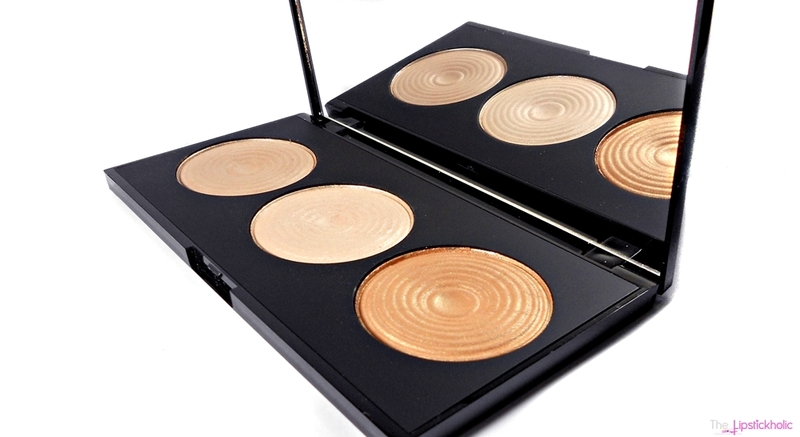 This palette contains three good size radiant lights highlighters. The texture of these highlighters is buttery soft. In fact the texture of these highlighters is somehow comparable to that of The Balm Mary-lou Manizer. It is so smooth and blends very easily. I have tried using these highlighters with and without foundation and these apply and blend smoothly in both the cases. The best thing about these highlighters is that these are not very shimmery and provide a nice subtle sheen to your face without going overboard. I love the soft natural glow these highlighters provide and this is my current favorite go-to highlighter palette. The staying power of these highlighters is pretty decent too, not very remarkable though. These last on me for about 4 to 6 hours easily. Now talking about the three gorgeous shades included in this palette. The shades included in this palette are fairly pigmented. However, I must say the pigmentation of these is somehow more subtle as compared to other highlighters. One swipe of these powders add a light sheen to my face/cheeks. But I do I feel the need to apply more for a subtle yet noticeable glow. The first shade from the left is a lovely warm champagne shade. It is the least pigmented shade of all and is not shimmery. I need to apply this one a lot to make it show up on my skin. The second shade is such a gorgeous silverish champagne shade. This one contains some fine shimmer in it and provides such a subtle glow in just one swipe. The third and last shade in this palette is a very nice gold/bronze shade. It is the most pigmented shade of all and is perfect for a warm summery glow. So once again Makeup Revolution has wowed me with this radiance palette. These highlighters definitely do not provide that full 100 watt glow but provide a nice subtle luminance to your face. I so love the soft and subtle glow these add to my face and love using this palette everyday. For the price, this palette is really amazing. It has three gorgeous shades that will compliment almost all skin tones. If you are not a fan of shimmery highlighters and are looking for something that adds just a subtle glow to your face, then I definitely recommend you to try this palette. Am sure you will love it too. Price & Availability: In Pakistan, this palette is available online exclusively at Daraz.pk for PKR 1300/- only. For international readers, MUR Radiance Palette is available at Makeup Revolution Website for £8.00 only. To stay updated with latest Makeup Revolution launches in Pakistan join Makeup Revolution Pakistan on Facebook. Great review and lovely swatches. i like highlighters that provide subtle glow. Awesome palette! Love your review. I need to try something by MUR. Everything is so good! After reading this review, I so want it now. Review: Sigma Beauty Lip Vex Lip Glosses...!! !